"Being a Vegetarian", Is it tough? How do you manage? How can you NOT have meat? Don't you crave for some? You don't eat meat, but watch Food Network? Oh! You are that ghass-poos types? C'mom people, especially the meat-eating ones. Stop judging the vegetarians. If we, vegetarians can be laid back and are non judgmental about your eating habits, then why are you? "..The beef industry has contributed to more American deaths than all the wars of this century, all natural disasters, and all automobile accidents combined. If beef is your idea of "real food for real people" you'd better live real close to a real good hospital..."... Yep, its true! I am not here to rant and start a debate or to promote that vegetarianism is better. I am just saying - One is free to choose what to eat and what not to eat. Don't be judgmental. Live & Let Live. 1. The challenge is to take a classic (or famous) Non Vegetarian dish and give it a Vegetarian interpretation. 2. The final dish should look as close as possible to its Non vegetarian counterpart. 3. If you can also make the texture/taste similar then it would be awesome, although its purely optional. 3. Usage of store bought Mock meats (or mock anything) is not allowed. I chose to make a classic, non vegetarian recipe called - "Rogan Josh", normally made with mutton and gave a vegetarian twist with tofu and cauliflower. I went with these two as the recipe involved marinating the meat and tofu & cauliflower have a tendency to absorb such flavors very well. Sandeepa's Trivia: Rogan means oil in Persian, while Josh means heat, hot, boiling, or passionate. Rogan josh thus means cooked in oil at intense heat. Another interpretation of the name rogan josh is derived from the word rogan meaning color and josh meaning passion, hot or red. It is originally a classic meat dish which is red in color. I have used a tad bit less chilli as I was serving this for my cousin-brother who doesn't eat a lot of heat. Next time, I am gonna try for that authentic "red" color. I have adapted this recipe from Bong Mom's Cookbook - Mutton Rogan Josh. Since I was working with Tofu and Cauliflower, which are very bland in taste as-is, I added some more spices in the marinade. The ingredients-list is effectively the same, it is just that I used them in a different order :-). Also, my version was a little on a dry-side. Simmer it in little more water would make this gravy-based. 1 medium cauliflower, washed and cut into florets. Place the tofu on a cutting board and a bowl with half filled water on it (for 10-15 mins). 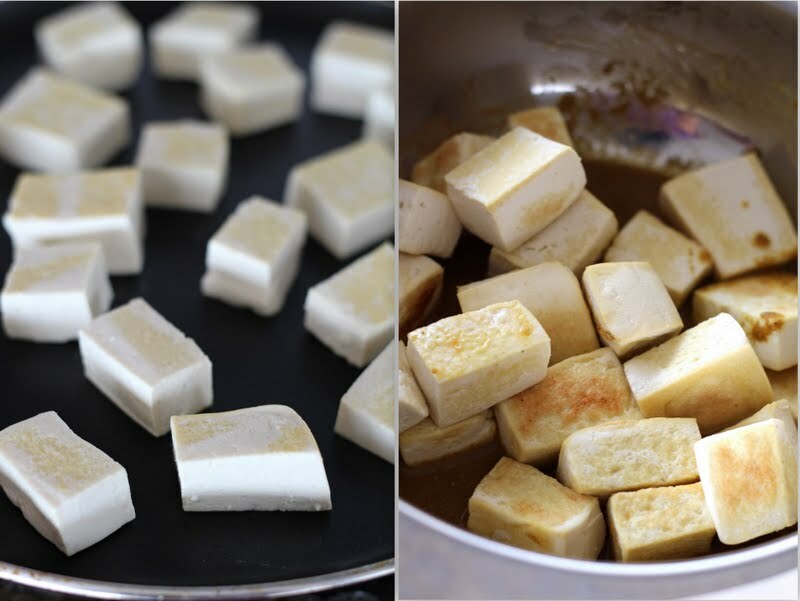 Make sure the pressure is not too much which can crumble the tofu. Cut them into small chunks (as shown below). Heat a non stick pan on medium heat. Once hot, place the tofu chunks on it. No oil required. Remember, we are just dry frying. Occasionally, keep turning the sides so that it is evenly, lightly browned. Prepare the Marinade: In a bowl, mix ginger garlic paste, ground cumin, turmeric, coriander powder with salt and water. Whisk the contents well. 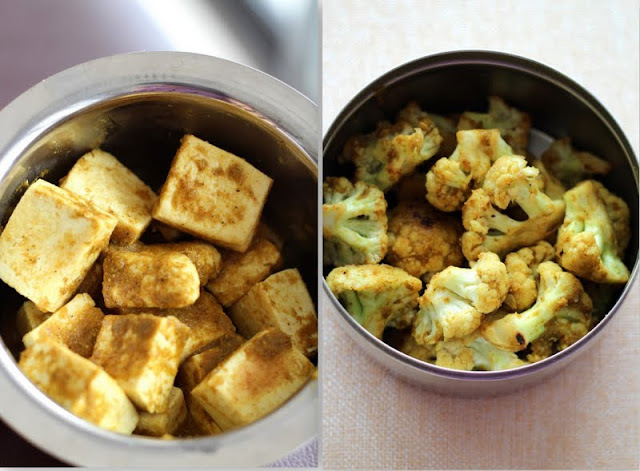 Divide the marinade into two separate bowls and put the tofu pieces into one and cauliflower florets into the other. Carefully, mix so that sauce coats them properly. Cover and Refrigerate it for at least 2 hours. After about an hour and half into marination, you can start the following steps. Melt butter in a kadai and add chopped onions to it. Sauté until thoroughly browned. This adds significant flavor to the dish. Please be patient and don’t skim on the sauté time. :-) Cool down a bit and grind into a smooth paste. Keep aside. Heat oil in the same kadai and add bayleaf, cloves and cinnamon. Once it starts to sizzle, add fried onion paste. Next comes the dry spices - fennel powder, pepper powder and chillo powder. Add a little water and fry the masala until oil separates. Next add marinated tofu and cauliflower florets. Mix well, lower the heat, add the yogurt little by little, mixing in the middle. Let it simmer for 1 min. Add 1-2 cups of water and adjust salt and spices if necessary. Cover and cook on low heat, giving it a careful stir for every 5 mins until the cauliflower florets are fully cooked. Finally, sprinkle some garam masala and it is ready to serve. You ask, what to serve with? Hmmmm, how about I share a very very simple biryani that can be made in a rice cooker. I end up making this biryani (which I learnt from my mom) atleast once in a week with a spicy gravy dish on the side, just for the fact that it is so easy to make. Wash rice and drain water, completely. Keep aside. Heat oil in a kadai, add bay leaf, ginger garlic paste and mint leaves. When it starts to sizzle a bit, add the mixed veggies. Saute them for 4-5 mins. Add the salt & garam masala. Finally the rice and Mix once or twice. Empty the contents of the kadai into a rice cooker. Add 3 cups of water. (rice:water ratio - 1:1.5). Cover and cook until it shifts to - "Keep Warm". Isn't it one easy-peasy recipe? Just stick to the rice to water ratio - to not to end up a sticky biryani.. Loved the recipe choice, and the end result looks so delish. Who wants to eat meat when you can dish up something so good without all that paap? Wow I love the detailed instructions and the pictures. Will try veg rogan josh with josh soon. Mads - Done deal. I will make this combo for you, surest. I like your *paap* comment. LOL! I think this will give my family to rethink the bean curd option....I did not like it one bit the first time I had tofu, though soya nuggets and such were being somewhat regular. I have a picture of the 'real' rogan gosh in a book. This one looks just the same too! Nice one, Siri. I love how you've explained it all before diving straight into the recipe. I certainly have lots of 'Josh' to make this Veggie version of something I've always eaten made non-veggie. Also, seems like you have beautifully adapted yourself and your blog to cooking and writing about it all back home. Kudos! Siri, saw this post on my wall a while ago and have been meaning to check it out. The gobi-tofu combo looks awesome. I have a cauliflower sitting in the fridge for a while. This is perfect to make over the weekend. Love your veg biryani. I make it the same way except I sauté everything in a three litre cooker and pressure cook it. I have not cooked rice cooker biryani for a while. I used to cook it quite often. Love it! You know what? Indian vegetarian food is THE food that has made me enjoy vegetarian dishes...I don't miss the meat at all!